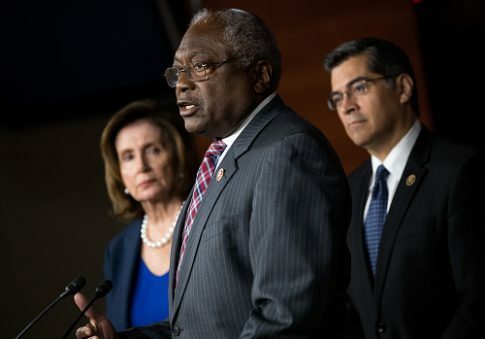 Rep. James Clyburn (D., S.C.), the House assistant minority leader, said Wednesday that congressional candidate Alexandria Ocasio-Cortez will need to wait her turn before she considers joining Democratic Party leadership. "I would ask her to remember how long I had to wait to get here," Clyburn said on Buzzfeed's "AM to DM." Clyburn also said many younger activists don't have the proper respect for older ones, such as himself, who dealt with segregation and civil rights in the Jim Crow-era South. "Let’s not forget the history of all of this," Clyburn said. "And I think that all of the folks who have that mentality seem not to give much respect to those of us who sat in jails, as I did, so that they would have the kind of activities or the kinds of rights that they have today." "So do I get any credit for being on the cutting edge of all of that?" Clyburn asked. "Or should the credit go to my children and grandchildren who are the beneficiaries of it? I think that we have to balance this out." Ocasio-Cortez, a 28-year-old democratic socialist who shocked the political world in June with an upset primary win over Rep. Joe Crowley (D., N.Y.) in New York's 14th Congressional District, has aggravated some Democrats, particularly after she accused Crowley of continuing to campaign against her. Clyburn also responded Wednesday to growing calls within the Democratic Party for new leadership. He has served in House Democratic leadership with Reps. Nancy Pelosi (Calif.) and Steny Hoyer (Md.) for several years, most of which has been in the minority. "If I begin to show some senility, my wife would be the first one to tell me. And my children would second those emotions very forcefully," Clyburn said. This entry was posted in Politics and tagged Alexandria Ocasio-Cortez, House Democrats, James Clyburn, Nancy Pelosi, Steny Hoyer. Bookmark the permalink.